The Ranthambore Ganesh ji is very old temple on the palace of Ranthambore fort. It is very heart touch place for devotee and visitors. Ranthambore Ganesh Temple dedicated to Lord Ganesha is located in the fort of Ranthambore, about 12 kms from Sawai Madhopur It is said that; in 1299 AD, there was a war between King Hammeer and Alauddin Khilji. During the time of war they filled there godowns with foods and all the necessary things in Ranthambhore Fort, where King resides. Since the war lasted for several years, the stock in godowns were over. One night when King Hammer; who was a great devotee to God Ganesh, was sleeping, he dreamed that Lord Ganesh came to him and said that by tomorrow morning all the problems and lacking would be over. In the morning an idol of Lord Ganesh with three eyes*(Trinetra), embossed from one of the fort’s wall. As a miracle the war was over and the godowns were full. In 1300 AD King Hammer built a temple of Lord Ganesh and placed Riddhi Siddhi, his wife and two sons Shub Labh along with the idol of Ganesh. His vehicle mushak (mouse) is also placed there. Ganesh Chaturthi holds a special place in Ranthambore and is celebrated to commemorate the origin of Lord Ganesh, who is said to have been born on this day. 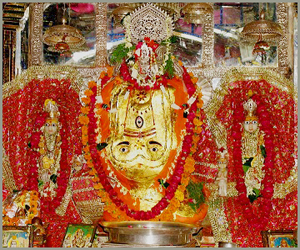 The Ganesha temple in the fort of Ranthambore is one of the most eminent Ganesha temples of Rajasthan. On this day, thousands of devotees visit the temple. There are songs and 'bhajans' praising Lord Ganesha. The area has its own share of markets where you can find general merchandise and small trinkets to shop for. The Ganesh Temple, which lies very close to the main entry gate to the Fort, attracts a steady flow of pilgrims, mainly from the rural hinterland. During the annual Ganesh festival, tens of thousands of pilgrims visit the temple, from all over the country.Most of the visitors to the Fort tend to stay in the Western part of the Fort. Very few visitors go to the eastern part of the fort, which is nearly wild. A small perennial stream called Gupt Ganga flows in this part of the Fort. Here one can see a large number of birds, Langurs, the odd small cat and sometimes, even leopards. The fort is one of the best places to look for the very rare and elusive Fishing cat.